​Over the past few years increasing utility costs, climate change and growing accessibility of renewable energy systems has led millions of people to look to solar energy as a way to power their future. If you're looking to install solar panels on your home or business, great job! Due to a combination of low costs and record-high financial incentives, there has never been a better time to go solar. Going solar does more than help you and your family live a more sustainable lifestyle, it can save you tens of thousands of dollars over the lifetime of your investment. Some of the ways a solar investment pays you back might surprise you! ​​Residents in New York State and across the country are getting blindsided by increasing utility costs year in and year out. NYSEG rate increases this spring were the second such round of rate increases in 2018 alone. Some residents saw their electric bills increase as much as 25% overnight. Solar power gives you control over rising energy costs all year round. No more dipping into that emergency fund in February because your utility company jacked up rates. ​​5. ​ You Can Reduce Your Tax Burden For Up To Twenty Years! ​Since you're researching solar panels, you likely know about tax incentives available to those investing in solar energy. 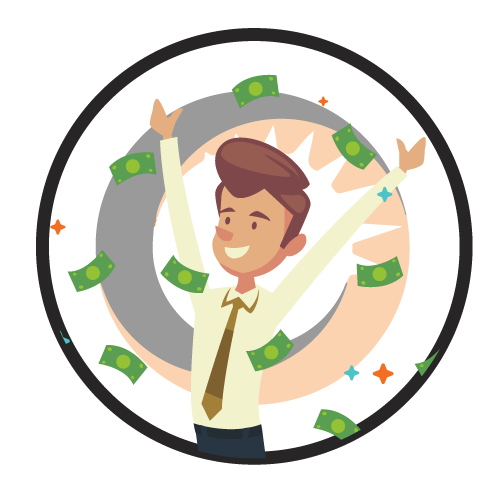 The average Renovus customer can enjoy $10,000 in solar tax incentives the year after investing in their system. Federal Tax incentives are set to step down in 2020, but current solar customers can take 30% of the cost of their solar system as a tax credit the year after their investment. For the average Renovus customer that's more than $5,000! New York State offers a similar program. Residents investing in solar panels can take a tax credit of 25% of the total installation cost, up to $5,000. What many people don't know, is that you can stretch these tax credits across multiple years. Instead of taking a $5,000 New York State refund next year, you can take $1,000 a year over the next five. You can also stretch the Federal Tax credit across as many as 20 years. Instead of a massive boost in year one, you can extend your credits, giving you a consistent boost to your vacation fund year after year! As with all tax-related issues, we urge you to consult your accountant when making decisions surrounding the utilization of tax credits. ​want to learn more about solar tax incentives? ​We ​re-wrote the book on solar ​tax incentives to make it easy to understand how you can use a solar investment to get a $10,000 refund next year. Every Renovus customer gets complimentary monitoring with their solar system that helps customers view how much energy their system is producing at any given time. Being able to see your real-time production and consumption often has the unintended side-effect of turning our customers into energy vigilantes! Solar customers regularly pay more attention to the efficiency of their home appliances after investing in a solar system, due to the ability to view their habits in real time. Additional power monitoring systems like the Nurio home monitor help our customers identify energy hogs, and cut them out of their energy ecosystem. Every Kilowatt Hour saved is money in the bank! We're have to be honest with you... saving money with solar is addicting. Once our customers see that utility bill disappear, many of them ask "How else can I save money with my solar system?". Often our customers will expand solar systems to account for new electric heating systems or even electric vehicles! Using an electric car as an example shows how much you can save. The average cost of gasoline in the U.S is around $3.00 a gallon at the time of this article. If you drive the U.S average of 10,000 miles a year, and your car gets 30mpg, that means that you would spend just about $1000 a year on fuel. If you were to switch to say, a Nissan Leaf or other electric vehicle the savings become exciting. The newest Leaf uses about 34KwH per 100 miles. The cost per kWh of a solar system is approximately $.12/kWh. Run the numbers, and you're looking at an annual "fuel" cost of just over $400 a year. That's nearly a 60% savings with solar. If your solar system is paid off? Goodbye fuel costs! Renovus has a fleet of electric vehicles. 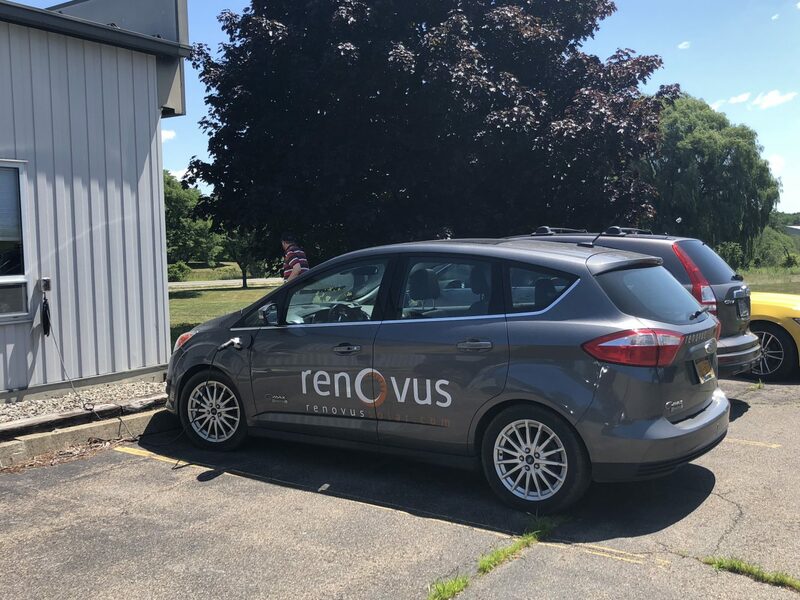 This Ford CMax is charging using energy from a nearby solar farm that powers Renovus' Ithaca, NY headquarters. Renovus Solar systems have guaranteed production for 25 years. For many people, it is likely that they sell their home at some point in that time frame. Lucky for those folks, solar systems add a great deal of value to homes. The Lawrence Berkeley National Laboratory has published a simple way to calculate the payback of your solar system. They say that a solar system added as much as $5,900 of value to your home per kW installed. Accounting for price drops, that would be about $4,000 per kW today. The average Renovus Solar customer has about 7kW of power installed on-site, meaning their systems can add as much as $28,000 to the total value of their homes! Couple this with the fact that homes with Solar Systems sell as much as 20% faster than their non-renewable counterparts and you have a can't lose proposition! We saved the most obvious for last; solar systems can ensure you never pay for electricity again. Rates are rising, and the cost of electricity is increasing dramatically for residents all across New York State. The combination of low prices, record high incentives and working with companies like Renovus mean that the average New York home can go solar for a total cost of just north of $8,500. Finance that system with someone like our friends from Alternatives Credit Union, and you can pay as little as $85.00 a month for a 15-year loan. That means that your old $120 a month bill is gone, and is now replaced by a lower monthly investment with no seasonal spikes. Under these circumstances, you would be paying 30% less for your electricity immediately. After your loan term has passed, you would be paying ZERO a month for your power. 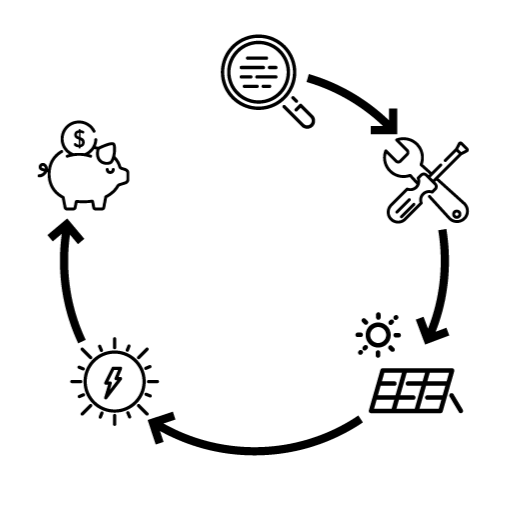 Solar is a simple and affordable investment that can help you save money immediately, make smart choices about your energy consumption AND help you build positive equity in your home or business. Are you interested in making the smartest investment of your life? Click below, and our team will draft up a free evaluation of your home or business.